I’m sitting on a Virgin Blue 737-800 as I write this, flying home to Sydney after an excellent weekend at the 4th Australian Interactive Whiteboard Conference hosted by IWBnet and Emmanuel College on the Gold Coast. As I mentioned in previous posts it was a thoroughly enjoyable conference. It had “buzz”… a great general ambience and perfect location. I was fortunate to have been asked to present a few sessions at the conference too, since I always enjoy the opportunity to share ideas with other teachers as I find I learn a great deal from the experience myself. The feedback was also fairly positive, so that’s a nice thing. Whether is was just because I got to hang out with great teachers, catch up with old friends, stay in a nice resort, or do canapes and cocktails from the observation deck at Q1on Friday night, I thought it was a top conference. If you’re interested in hearing a bit about what went on there you might like to keep an ear on The Virtual Staffroom podcast… I recorded a whole lot of audio from the event as I wandered around with my iPod nano and iTalk voice recorder. There are some interviews with the organisers, impromptu chats with some of the delegates and a special interview with Ben Hazzard from the infamous Smartboard Lesson Podcast. Check it out! As fellow OzTeacher Fiona Banjer pointed out to me, it’s nice to be able to go somewhere where you can talk geek stuff without people looking at you like you’re a geek. 😉 There were lots and lots of sessions over the two days of the conference covering just about every aspect of interactive whiteboards you can think of… from implementation strategies, creative use of the software, linking it to sound pedagogy, and great hands-on practical examples of how teachers are using it in their schools. If you had any doubts about the impact that IWBs are having in schools, attending this conference would quickly dispel them. There is enormous interest in this technology, and the fact that the conference has grown so much in size since last year is testament to this fact. It’s clear that IWBs are not just a passing educational fad but are here to stay, with many schools making large investments into the technology and many claiming some remarkable improvements to student learning outcomes in the process. However, one question that arose for me was where the hell was Smart? 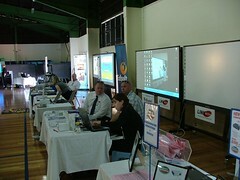 SmartBoards, made by Smart Technology and distributed excusively in Australia by Electroboard, was notable by their absence at this event. The fact that they didn’t turn up to this event (and most every other major IWB event) is starting to worry me. My school is looking at a fairly significant IWB rollout over the next few months – over $100,000 – and we had planned to implement the SmartBoard brand because we really like them. I have done my comparisons between Smart, Promethean, Easiteach, StarBoard, Interwrite and so on – in fact there were 18 different vendors at the conference – but so far I still like Smart the best. I find their software effective and easy to use and overall I am impressed with their products… what I don’t get is their stealth approach to marketing in this country. I don’t know if it’s just a sense of arrogance that they feel they are the major players in the IWB market and therefore don’t need to promote any sort of presence at events like this, or whether they are not planning on staying in the Australian market… I really just don’t get their lack of interest in promoting their product. There were lots of vendors at the conference, all showing their wares. There is tremendous innovation happening with IWB technology at the moment and delegates came to the conference eager to learn more about the hottest new emerging products. There’s no doubt that Smart is historically a major player in the IWB market, but they were certainly not around to solidify that reputation at Emmanuel. If I were a teacher in the market for IWB technology (and lots of people at the conference were) I might well be having a few nagging doubts about Smart’s ongoing presence in the Australian marketplace. I’ve been watching this technology for a couple of years now, and having taught in Canada at a Smart reference school in Ontario and getting training from the PD team attached to Smart’s Calgary headquarters, I feel I have a reasonable grasp of what Smart offers. But to a casual observer, or someone taking a more recent interest in IWB technology, Smart in Australia is all but invisible. I’m really disappointed with Electroboard, since they are supposed to be Smart’s Australian distributor. From what I see, Electroboard is doing nothing to promote the brand here… I think Electroboard’s lack of presence at this event sent a hugely negative message about their committment level to this market… to me it screams “we are not interested in the education market”. Just think… there will be 450 people going home from the conference this weekend, many of them all fired up about what this technology offers and eager to start implementing an IWB program. 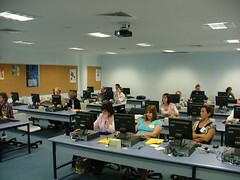 Many are ready to spend their money on what they think is the right technology for their school. These teachers, principals, ICT coordinators, librarians, etc, came to this conference to learn more about what they need and to look at what options they have, and there is little doubt in my mind that this conference will be a catalyst for hundreds of thousands of dollars worth of IWB purchases over the next 12 months. To many people who attended the conference this weekend, Smart appears not to even exist, and it’s quite unfortunate to think that so many of them will not even consider Smart when it comes time to purchase. I’ve always been a big SmartBoard fan, but I’m starting to have second thoughts about whether they are at all interested in gaining my school’s business and wondering whether maybe I need to start looking at other brands more seriously. So come on Electroboard! Get your act together! I don’t know what issue you have with respresenting your product at this sort of event but it’s about time you dealt with it and started convincing us that you really do want to be a player in this game. Not Very Smart by Chris Betcher is licensed under a Creative Commons Attribution-ShareAlike 4.0 International License.